Mystery thriller starring Edward Underdown and Maxwell Reed. A small British seaside town is stunned by a double murder. A young repertory actress may have seen the murderer and now her life is in danger. 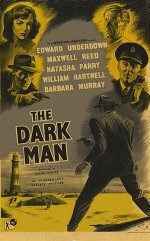 A killer called 'The Dark Man' commits double murder. This is witnessed by the young aspiring actress Molly Lester. The Dark Man tries everything to put Molly out of the way. Detective Inspector Viner of Scotland Yard investigates the murders.